How Much Money can my company receive from the state for training? The ETP reimburses your company based on the number of qualified hours your employees receive. Who is the Employment Training Panel (ETP)? 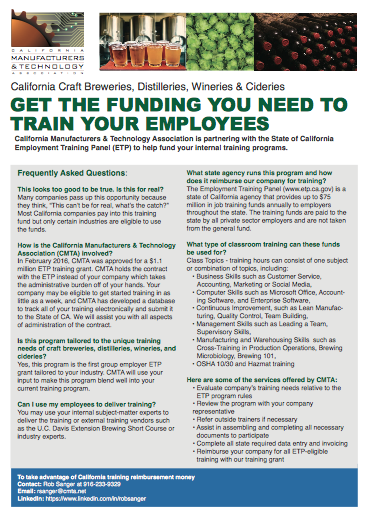 ETP is a California State agency that began in 1983 and is designed to fund training that meets the needs of employers for skilled workers and the need of workers for good, long-term jobs. Where does the ETP get the money? ETP gets it money from the companies’ earmarked payment into the Unemployment Insurance (UI) Fund. The UI fund is administered by the State’s Employment Development Department (EDD). Who is the California Manufacturing & Technology Association (CMTA)? Does my company have pay CMTA a fee for assisting with the ETP application process? In most cases, No. CMTA receives funding from the state of California to find eligible companies and assist these companies with the application process. Since CMTA receives funds from the state of CA, we do not charge companies for this service. Does CMTA provide training courses? CMTA does not provide training. CMTA assists employers in applying for training reimbursement funding from ETP. Does ETP provide training courses? ETP does not provide training. ETP provides the guidelines for reimbursable training topics. Who is eligible to conduct the training? You can choose to use your own employee to deliver the training, an employee from another office site of your company, professional trainer, or training group. If you use a vendor to conduct training, the vendor must sign a sub-agreement and be located in California. Which training topics are eligible for reimbursement by ETP? What training courses are not covered by the ETP program? What are the acceptable training methods for reimbursement? Is videoconference training or training by CD/video eligible for reimbursement? Is there a class size requirement? There is no minimum class size; however, there is a maximum class size ratio of 20 trainees per instructor. Advanced Technology classes have a maximum class size ratio of 10 trainees per instructor. What about training on-site vs. off-site? You can choose to conduct training at your own location or any other site, as long as training takes place in California. Do I have to train all of my employees? You may choose to train as few or as many of your employees as you choose. However, no more than 20% of your trainees can be managers or supervisors. Any full-time, permanent employee who has been on your payroll for at least 90 days and meets the ETP minimum wage requirement for the county in which your company is located. Are there guidelines on the number of training hours? How does my company get reimbursed? You input trainee information via the online ETP database. The reimbursement plan is “pay-for-performance”. As your trainees complete a minimum level of training, you submit an invoice for payment which is processed by ETP and will amount to 25%. At the completion of training, your company can submit invoice for 50%. After the trainee meets the 90-day retention period, the final 25% will be earned. How much time is allowed for an employee to complete his/her training? The standard ETP agreement is for 24 months which includes the 90-day retention period. Your employee will have to complete his/her training within 21 months and then will have to complete the 90-day retention period for your company to receive reimbursement. What if my company pays for a professional trainer or training materials? Will my company be reimbursed for these expenses? Your company’s investment in trainers or materials is not reimbursable. What about training that my company has already conducted? ETP funding is not retroactive. Funding is only for training hours that begin after your application has been approved and within the term dates of your agreement. What is the process to apply for this program? Complete the initial eligibility determination with your CMTA representative. CMTA and an ETP analyst will contact you for a site visit. Your application is reviewed by the ETP Panel at the monthly ETP Panel meeting. Once approved, the ETP rep conducts a Start-Up meeting and your training hours can begin. What is Quick Start Training?